This week we dive into biometric identity verification before a whistle stop tour of the world of financial crime regulation with stops in Denmark, Cyprus, and the United States, where shell companies and real estate are firmly in regulator sights, before we end in Taiwan. Sanctions, meanwhile, are top of mind in Singapore and Eastern Europe, and predictions abound about the adoption of disruptive technology in 2019 and beyond. In 2013 Oxford Dictionaries named “selfie” as word of the year. Three years later, HSBC became the first bank to use facial recognition technology to allow customers to open an account. Today, we are increasingly used to a range of biometrics, from selfies to voice recognition and vein patterns, providing us with the ability to prove our identities without the need for paper documents. As biometric identity verification (IDV) gains traction with financial institutions, online retailers and payment services providers, an opinion piece in American Banker calls on banks to ditch Social Security Numbers (SSNs) for IDV purposes in favour of more secure options. The increased threat of cybercrime and data breaches is also leading governments to lend their support to alternative forms of ID verification. In Singapore, a government-backed facial identification service is to be trialled with banks and hospitals in 2019. Getting back to physical authentication would not serve the purpose because now investors want to get things done faster. We’ve covered the Danske Bank money laundering scandal extensively in previous issues of The Full Picture, This Week, but could this just be the tip of a colossal iceberg involving other major Western banks? Across the Atlantic, shell company real estate deals are coming under increased regulatory scrutiny due to their attractiveness to money launderers. Regulators have expanded a 2016 geographic targeting order to cover five new cities. The order requires reports to be filed for cash purchases of residential properties through limited liability companies of US$300k or more in 12 metropolitan areas, according to the Wall Street Journal. And in Asia, Taiwan is optimistic following a review of it’s AML regulation by The Asia/Pacific Group on Money Laundering (APG), in which inspectors were said to have found that the country had made “significant progress” in its evaluation this year. The country’s official rating will be announced in 2019. You see that almost every month there are either European Union sanctions or American sanctions. This problem is already there but during the next year I’m sure this problem will probably be even bigger. In this fascinating video the Wall Street Journal asks how to stop Iran oil-sanction busters? Take 50 million photos a day, apparently. In more future predictions, IDC expects that by 2024, Artificial Intelligence-enabled user interfaces and process automation will replace one third of today’s screen-based apps. I’m told this is the first of its kind in the world – where the regulator and industry have come together to set guidance on the responsible use of AI and data analytics. This will be a living document that will be continually updated as we learn more. This week, we announced the release of our new, global biometric ID verification and document authentication feature. Using advanced imaging algorithms users can authenticate official identity documents and conduct biometric checks against a “selfie” of the person being onboarded, in addition to conducting bureau checks for further validation. Bureau searches are carried out globally, using a customer’s preferred sources. Also on our blog, a recent post by encompass Head of Sales, Simon Lemos, explores the benefits of a single solution for onboarding your entire customer base, from large corporates through to sole traders and individuals. And, when it comes to law firm compliance requirements, we outline four reasons that make audit trails a critical step in the compliance process. We’re also delighted to have come highly commended in Regulation Asia’s inaugural Awards for Excellence in the RegTech category for AI & Machine Learning. 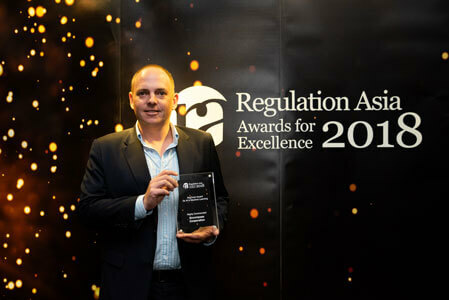 David Williams, Sales Director Asia Pacific for encompass, at the Regulation Asia Awards Ceremony. On Wednesday 21 November we’ll be attending The Law Society of England and Wales Anti-Money Laundering and Financial Crime Conference in London. The day will be focussed on the latest AML Policy for law firms, practical workshops and the regulatory landscape. The following week, on Thursday 29 November, we’re over in Ireland for the Scottish Irish Finance Data & Techfin roundtable. Bringing together leading Irish and Scottish fintech firms to discuss lessons learned, useful insights and best practice in Blockchain, Distributed Ledger Technology, and Machine Learning.